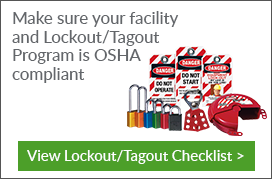 Valve lockouts help prevent potentially harmful accidents during maintenance or repairs. Valve lockout devices allow workers to close off or isolate energy sources such as electricity, hydraulic pressure and fluids. These lockout devices are designed for specific uses. Gate valve lockout devices, for instance, generally include an outward/inward rotation to allow easy installation and storage. Ball valve lockouts can be used on ball valves as large as 4?, while butterfly valve lockouts can easily lock out energy sources. Seton offers a wide range of styles for customers to choose from. Gate Valve Lock-Outs block access to valve handles. Red plastic gate fits valve handle 1" to 2-1/2". Gate Valve Lock-Outs block access to valve handles. Red plastic gate fits valve handle 2-1/2" to 5". Injuries resulting from accidents due to hazardous energy can be serious, even fatal. According to the Occupational Safety and Health Administration (OSHA), electricians, machine operators, and laborers are a few of the 3 million workers that face this risk at their job every day. When energy accidents occur, victims can suffer from burns, electrocution, cuts, lacerations, fractures, and other severe injuries. Because of this, OSHA implements regulations regarding the control of energy hazards in the workplace. Included in these standards are pointers on using devices such as valve lockouts and other tools. These devices are an important aspect of LOTO programs and help keep employees safe on the job.